I have an in ground Doughboy pool with a brick built retaining wall all the way around. I really need to know how to backfill please...I'm desperate !! Hi Christine. The problem with building retaining walls around above ground pools instead of just backfilling them is that they hold rain water. This water sitting around the base of the pool can cause a lot more rust than if the pool just had dirt up against it. 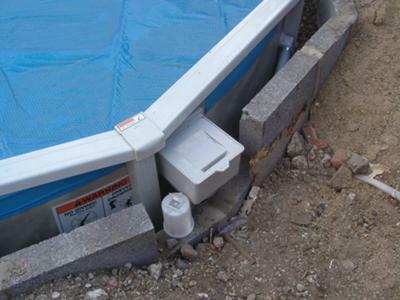 Too much water can also damage the pool base, depending on whether you have sand or some type of foam. I would backfill this area with clean fill dirt or possibly some type of crushed granite. You want to use something that will pack firm. You want to avoid anything like sand or gravel around the pool because it will not pack solid. Sand or gravel would cave the pool walls in anytime the water level was lowered. You want something that will pack rock hard so in a couple of years the liner can be changed without the wall caving in. The pool needs to be completely full as you are backfilling. This will hold the wall in place while you shovel the dirt in around it. Since you don't have much room to work you will have to be careful not to fill the pool with dirt. After it is filled in you could lightly water it for a few days and then probably add some more dirt to top it off. This would help it to pack firm. Whether or not you want to try and protect the wall is up to you. Most of the time we don't as the Doughboy wall is very well coated in the factory. For those that do want some extra protection roofing tar is usually painted onto the pool wall and uprights. That would be a little difficult in your situation. If rust was a big concern you could hang landscape plastic against the wall before backfilling. This would put a barrier between the pool wall and the dirt. 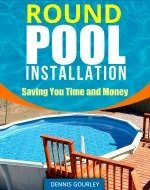 Once your backfilled area is firm and packed it really does not matter if you get a few rust holes in the wall, you have a solid foundation around the pool to hold everything in place. Wall reinforcing and repairs could be done at liner changing time, but as long as the pool was holding water I would not worry about it. Hi, thank you so much you really have been an enormous help...many thanks! !